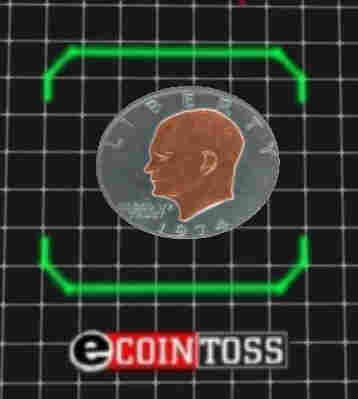 Virtual Coin Toss Lets Football Fans Watch The Flip Technology similar to what's inside a Nintendo Wii controller lets fans watch a virtual coin flip through the air just as the ref's real coin does. For decades, the coin toss at the start of every football game has been obscured from fans' view. Inventor Dan LaRue was fed up. "We're seeing six little people, very far away, doing something in the center of the field, and we can hear the ref talking about it, but we cannot see it," he says. So he decided to take action. He invented a system called eCoinToss. It consists of a special coin embedded with technology similar to what's inside a Nintendo Wii controller. The chip wirelessly transmits data about the coin's position to a computer. The computer synchronizes this data with a virtual coin displayed on the stadium's JumboTron. The result: Fans can watch the coin flip through the air live, as it happens, and even see the outcome of the toss before the ref does. "This is a great way to take those 30 seconds of time that we can't experience very well, and give the audience something very clear up on the JumboTron," LaRue says. Steve Ehrhart, director of the Liberty Bowl, helped give the eCoinToss its big break in 2009, and brought it back again for this year's game. "In the age of technology, we're always looking for a better way to do things," Ehrhart says. "I hope it spreads. It was a very effective way of getting the 62,000 fans who were in the Liberty Bowl stadium there to participate in the coin toss." This promotional video from eCoinToss.com shows their virtual coin in action. the proper elements. Please install the Flash player and retry.